Since time infinite, during every fourth period of the time cycle there are 24 Tirthankars (path finder or prophet) who acieve Omniscience. The Divine Murthis of Tirthankars Bhagwan Adinathji / Rishabhdevji, Bhagwan Parshwanathji, and Bhagwan Mahavir Swamiji have established in the sanctorum at the temple, to represent the current Tirthankars in the fifth period of this era. Thw word "Tirthankar" signifies a teacher sho reviveds the sacred principles of Jainism after achieving omniscience through total elimination of Karma. A Tirthankar is also called a Veet-raag meaning who is free from worldly attachments. 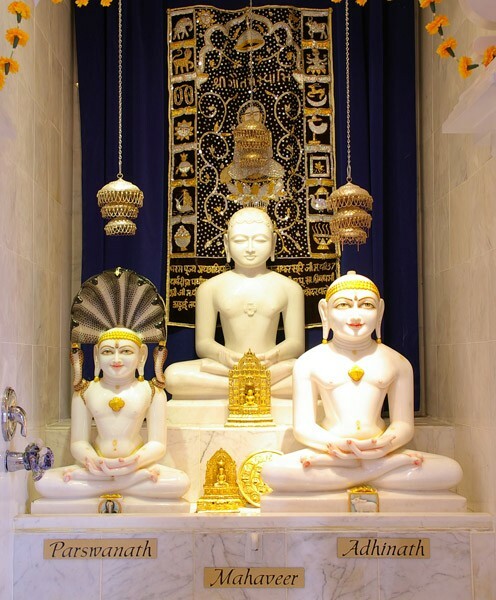 Bhagwan Adinathji is the first Tirthankar of the Jain religion. Bhagwan Parshvanathji is the 23rd and Bhagwan Mahavir Swamiji is the 24th - the last Tirthankar. At the Temple, Jain's practice six essentials of Sadhana in our daily life. These include Samayik (stay close to the soul - develop and practice equanimity), Stuti (do Logassa atleast 3 times - prayer of 24 Tirthankaras), Vandana (recite Namokar Mantra atleast 3 times), Pratikraman (ask forgiveness), Pratyakhyan (take vows and not to do the same wrong thing again) and Kayotsarga (do meditation). Puja of Tirthankardev is the first amongst the six essentials for doingn 'Upasana'. The remaining five are Guru Upasana, Swadhyaya, Sanyam (to control mind, and five senses), Austerity (tap), and Daan (giving to needy). Additionally, through various rituals that are designed by Acharyas, Jain devoetees try to understand the messages of God, practice proper conduct in life, and attempt to tap into their personal Shudhatma, which is the ocean of bliss and therby ultimately achieving liberation. Once a month we perform Snatra Puja written by Shri Virvijayji Maharaj. We remember various Tirthankars and pray for the peace and happiness of the whole universe. During the puja, we place a small brass or bronze murti of Tirthankar Bhagwan on the Sinhasan (throne) on top of three tables. Three tables and the Sinhasan symbolize the Samovsaran where Tirthankaras delivered sermons after attaining Kevalgyan, This also symbolizes the Meru Parvat where Inder Maharaj celebrates th ebirth of Bhagwan Mahavir Swamiji. Devotees are encouraged to participate in performing the puja by wearing clean clothes, put on Kesar Tilak and tie a dnad Chhadee (red string) on their wrists. Murtis are batherd with Panchamrit water which contains 1) clean water 2) Dahee (yogurt),3) Sugar or honey 4) ghee 5) kesar. After the bath (Prakshal), this same water is used fo r Shanti Kalash Puja which is the last part of the Snatra Puja. 1) Offering Kusumanjali: consists of water, rice, flowers and kesar. This is done to remove sins and bad karmas to become Siddhas. 4) Shanti Kalash and Chaitya Vandan: During this year, we pour water (Panchamrit from Prakashal) in a silver pot while reciting Shanti Mantras. Now, this holy water is considered to have special poweres to bring peace and happiness and remove obstacles in one's life. Devotees are supposed to bless themselves with this water. Whereever this water is sprinkled, that place becomes blessed. Once a year, we celebrate Mahavir Jayanthi (Birth of Lord Mahavir Swami Ji) in the month of April, Paryaushan Prava and 14 dreams of Trishala Mata (Bhagwan Mahavir Swami Ji's Mother) in the month of August or September, and 18 Abhishek to commemorate the Pran Prathista of Murtis at our Temple in the month of November.